Yesterday’s Zucchini Bread with Cream Cheese Filling was so good that I made a variation called Zucchini, Apple Carrot Bread. Instead of 3 cups of shredded zucchini, this recipe has 1 cup each of apple, zucchini and carrots. Also, this bread does not have a cream cheese filling, but rather a small drizzle of white icing. Unfortunately I didn’t have any red apples, which would have been nice because I could have left on the peel and had flecks of red, green and orange. 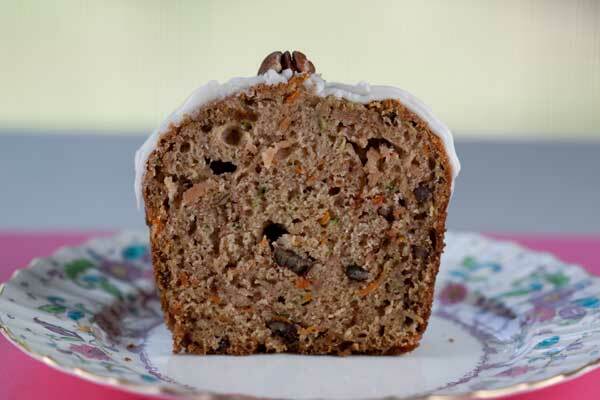 This loaf is made with Granny Smith, so it has green flecks, plus orange from the carrot. 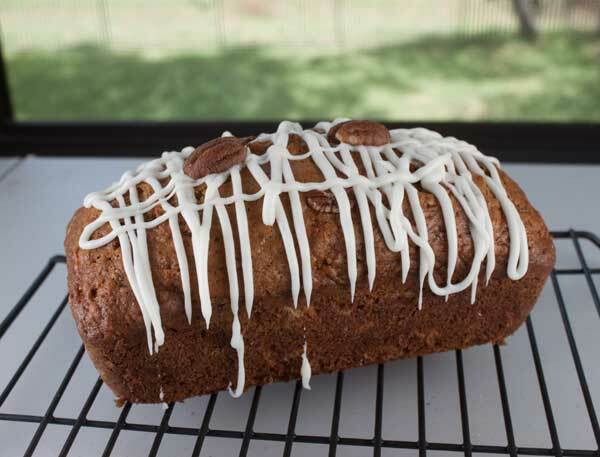 Quick bread made with zucchini, apples and carrots topped with vanilla icing. Preheat oven to 350 degrees F. Grease the bottom only of two 8x4 inch loaf pans or line the bottom with a strip of parchment**. Mix the flour, baking soda,baking powder, salt, cinnamon and nutmeg together in a bowl and set aside. In a mixing bowl, stir together the sugar, eggs, oil, zucchini, apples, carrots and vanilla. Add the flour mixture to the wet ingredients and stir until mixed. Stir in pecans. Pour batter into two greased loaf pans. Bake in the lower third of the oven for 55 -60 minutes or until a toothpick inserted near the center comes out clean. Let cool for 15 minutes. Loosen sides of loaves with a knife, then carefully turn from pan (or lift your strips of parchment) and let cool completely before slicing. If you choose to ice it, make the icing by mixing together 1 tablespoon of melted butter, 1 cup powdered sugar, 1/4 teaspoon vanilla extract and enough milk or water (I used water) to make the icing drizzling or piping consistency. Spoon or pipe the icing over the top of the loaf and leave at room temperature to set. My preferred method is to line the pans with a narrow strip of parchment paper that goes the length of the bottom of the pans and up the short sides. Theoretically, the sides of the loaf pan should be left ungreased, as this is supposed to help the batter cling to the pan and rise upward instead of inward. The loaves will dome nicely. Nadine, I hope you like it! This is one of my favorites. I just made this it looks so good , I have to wait it to hot. It will eaten by me and my husband thou. Darlene, I didn’t make any adjustments based on the color. I usually reduce the temp when I use my black Bundt pan, but this pan is kind of a dark grey. At any rate, it didn’t matter. Also, I the pan bills itself as nonstick, but I certainly had to pry the sides away and was glad I put the parchment on the bottom. I have an inability to trust “nonstick” ;). I’m assuming you baked these in the same pans you baked the Zucchini Bread with Cream Cheese Filling. Since the pans appear to be dark and non-stick, do you adjust (decrease) your baking temperature and increase the baking time? I’m never sure if I need to do this. Will put this on my TBB list. Also wondered if bananas would work?